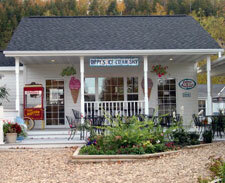 Located in the center of Founders Square, Fish Creek, Dippys has been serving fresh, Wisconsin made ice cream for over two decades. Huge scoops of Chocolate Shoppe Ice Cream top your cone or sundae for just you or to share with your friends and family. Hours: Everyday 10am Friday of Mother's Day weekend thru Oct. 31st Closed for the winter starting November 1st.